Argentine tango party in San Francisco. All photos by Marcy Mendelson. Barcelona, Spain... Couples dance Sevillanas at La Feria. Photographs by Marcy Mendelson. "...ethnic tradition is an inexhaustible source of inspiration. and the effect will always be amazing..."
influences of Turkish and Middle Eastern dance in his work. representatives of other nations, traditions, cultures and religions. this time he has also been using his fascinations in artistic creation. in music and fine arts. He found digital art to be the best form for transferring the past into the present. author considers himself to be a renderer rather than an artist. different, but at the same time my own way”. In 2006 he has two individual exhibitions in Bulgaria: Sofia and Varna. In preparation there are 2 exhibitions of TRANSKULTURA artworks series this year. posters. His works have been published in Poland, Germany, USA and UK. Transglobal Underground, Clotaire K, Laye Sow etc. 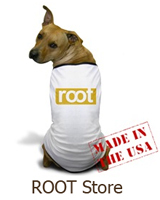 catalogues, websites for labels and artists releasing mainly world music, ethnic, folk. committed to his clients and their targets. overtone flutes, frame drums, zarb, darbuka etc. Rare is the moment when a chance MySpace surfing session leads you to your next favorite musician. I found Miguelito on MySpace and he was kind enough to mail out a cd of his album, Essa Batida, for review. 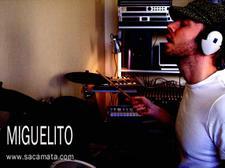 Miguelito hails from Sweden and is influenced by Brazilian and African rhythms. The whole album has a chill vibe without losing the energy and Miguelito's warm vocals bring it all together ... "Essa Batida" has been in constant rotation on my iTunes and I have to admit that I now have a little crush on Miguelito! Having the perspective of a drummer and a percussionist, Miguelito's songs always have a nice swing to them, inspired by living in Brazil working as a musician, but being influenced by African music as well. Add to these beats some sweet harmonies that gives a nice atmosphere in the music. On top of it all you can always sense the originality of the melodies coming out of Miguelito. You might even start to wonder where you're at... In the Caribbeans? In Brasil? No man, you're on planet Miguelito where everything is possible! Last weekend I attended the Harmony Festival in Santa Rosa, California. It was hot and crowded, but that didn't stop the masses from checking out the leather goods, frock coats and eating steaming plates of Caribbean and Indian food. I was a little wary of the whole scene, having flashbacks of state fairs in New Jersey and endless teenage evenings wandering the boardwalks of Atlantic City (don't ask). There was so much going on between various stages that sadly I missed the performances by Root Magazine friends, DholRhythms and Baby Seal Club. Night fell over the fairgrounds and the Techno Tribal Fest began with some big name DJs and incredible fire performances by troupes such as Lucent Dossier .... Perhaps the DJs needed time to switch out their equipment, I don't know, but the interim acts were absolutely horrible. If I ever see the Shamanic Cheerleaders again, I will scream bloody murder. I've never witnessed hundreds of people clear a dance-hall faster than when this painful act came onto the stage to destroy the energy generated by the Stanton Warriors who had just finished their set. My friends and I escaped the train-wreck, joking they needed a 'karmic hook' to drag them off the stage. We entered a smaller dance-hall where Sukhawat Ali Khan and Riffat Salamat were just getting started. To sit down in an intimate setting and witness musical royalty, clap along with them, eventually dancing with the whole crowd... this was the highlight of the entire experience. The pair can date their lineage back to court musicians for ruler Akbar the Great. Their father, Ustad Salamat Ali Khan, was one of the great classical Indian singers, and an influence on the legendary Nusrat Fateh Ali Khan. Sukhawat began singing at the age of seven, and has performed around the world for presidents and kings. 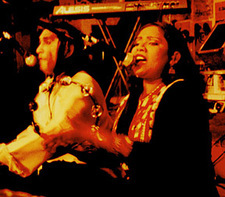 Renowned for his technique and passion, he shares vocal duties with sister Riffat, whose siren sensuality and harmony burn with the Qawwali Sufi tradition, making her a rare female exponent of a style from which women are generally discouraged. Perhaps I'm not a hippy at heart but the Harmony Festival tried my patience at times. The amount of trash generated and lack of clean bathrooms plus the cost of the event didn't make much sense to me. I think we would be better served to learn about green issues at events such as LOHAS or Green Festivals, and to separate the music/ dance & vendors into a different thing altogether. What I witnessed was a combination of family outing, new-age marketplace, flea market and teenage rave. It tried to be all things to all people, which in the end, was too much to ask. Long before I knew I was interested in dance, all I listened to was 90s industrial metal and goth rock. Nothing wrong with that, besides being angry all the time, and there is a place for that vibe for sure but... One day I walked into the (now closed) Tower Records Classical Annex looking for something dramatic on the listening stations. What I found was unexpected, a tango CD by someone called Astor Piazzolla. While I didn't have the $$ for the CD at the time, I returned to the store for a solid week just to listen to that tango music. Astor's genius has now been a solid staple of my music collection for nearly 10 years. Some readers may know him by the Grace Jones cover of Libertango, and YoYo Ma's arrangements. The album I love the most is Tango: Zero Hour. 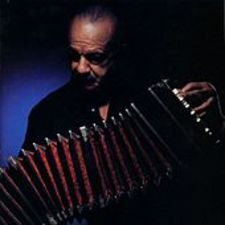 Piazzolla (bandoneón) and the musicians he assembled for this quintet (Fernando Suárez Paz, violin; Pablo Ziegler, piano; Horacio Malvicino, Sr., guitar; and Héctor Console, bass) gave the performances of their collective lifetimes when they made this album, recorded in NYC in May of 1986. It is the zenith of Piazzolla's career - and that's saying a lot, considering the contributions he made to music in his lifetime. The music is nuevo tango - the traditional soul of tango, full of the emotion that it has always carried (and with which it carries its listeners and dancers), charged and reborn with all of the grit and grime that exists `at street level'. Gosh - if the tangos we're used to hearing and seeing in the old films made your grandmother blush, this would most certainly put her on the floor in a dead faint. 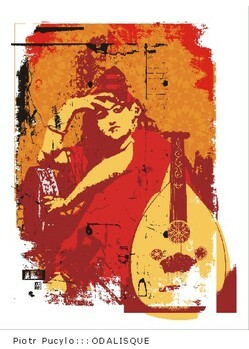 The music is intricately composed - but at the same time, it is FELT in the depths of the soul. There is nothing whatsoever cold and emotionless about it. The musicians themselves are of the highest caliber - some are classically trained, some have their roots in jazz, but they are all under the spell of Piazzolla's vision. The quiet passages purr and stroke the senses, the more strident ones will pick the listener up and toss them around. The music will make you want to close your eyes and drift away one moment, then have you sweating the next. The music of Astor Piazzolla epitomized our situation in the modern world with his fusion of folkloric beauty and contemporary tension. He forged a new music that challenged the traditionalist and left the adventurous craving more. He took the music of the great tango masters like Garde, ripped it away from the velvet-walled concert hall and the soft-cushion drawing room, and slapped it down on the pavement of Buenos Aires. Reviled by the critics, shunned even by the conservative government, his music spoke to the next generation, and popular and jazz musicians and listeners all over the world eventually fell under the spell of his "nuevo tango." In recent years, Piazzolla has taken the new tango back to the concert halls, composing and performing works for chamber ensembles like Kronos Quartet, larger groups like The Orchestra of St. Luke's, even an opera company. These works brought his once radical music back into the mainstream. Bracelet yourself! 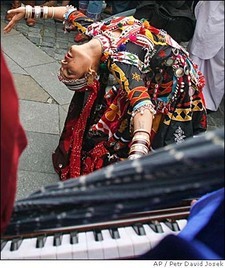 A Roma (Gypsy) girl dances during a march through central Prague, Czech Republic. Gypsies from across the world are gathered for the world festival Khamoro 2007. More information on the Khamoro Festival that began last week.